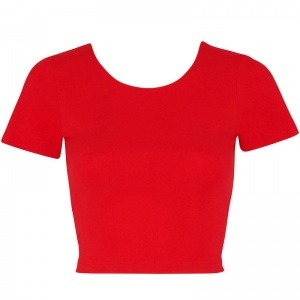 High quality form fitting, waist length cropped tee, featuring a relaxed neck opening. Small is approximately 16 1/2" (41.9cm) in total length. Form-fitting with dual stitch detailing. Cotton/Spandex jersey. 95% Cotton, 5% Elastane. Heather Oatmeal 92% Rayon, 8% Spandex.